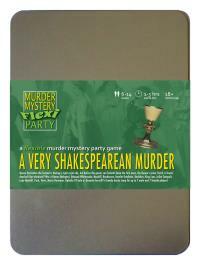 You've been invited to play the role of HAMLET OMELETTO in A Very Shakespearean Murder. What scream through yonder window breaks? Queen Derivative the Second is having a right royal ado, but before the guests can forketh down the first oxen, the Queen’s jester Yorick is found dead-ed! Join us to find out who-duneth-it! You wear a grey tunic, breeches and tights accented only with white collar and cuffs, because your mother says they make you look handsome. A small hand mirror comes in useful for naval gazing. Alas, poor Yorick, I knew him well - for I am Hamlet Omeletto, Prince of Denmark. Fondly will I remember Yorick’s last limericks, such a talented jester. ’Twas but the other morn’ he served me bacon and eggs in the Danish way. Too runny or not too runny, that was the question. In any case, at the time of the murder I was talking with my ghost of a father in my chambers.